When I can be bothered, I am possibly the laziest cook in all of creation. Anything that looks edible gets thrown in and somehow, the resulting mish-mash of random foods suffices. If I tire of this haphazard method of cooking, however, I can always turn to Limit Point Software’s food app, Foodmatic. Input all the ingredients you intend to use, and Foodmatic will calculate how well they will end up tasting together. Once you enter an ingredient, the app most helpfully suggests ingredients that would go well with whatever you’ve inputted. You can swipe left or right to choose from the Suggested Ingredients, or you can manually input them. Each time you enter a new ingredient (the app’s database is well-stocked, and you can scroll through it by tapping the magnifying glass in the top right corner), Foodmatic will automatically “score” your recipe by using a “proprietary algorithm to determine what flavors and foods go together really well.” If you’re interested in a certain ingredient, you can read about it by tapping the corresponding blue arrow; removing an ingredient from the recipe list is as easy as swiping across it (tapping the third bottom icon does the same). If you’re satisfied with your recipe, you can save it for future use by tapping on the first icon on the bottom bar; just tap the book icon to access them. Another nice function of Foodmatic is the Find A Recipe button (under the meter). Given that you don’t overload on the ingredients, Foodmatic should be able find you a recipe involving your ingredients, as it searches through multiple recipe websites–needless to say, you need Internet access to use this service. Unfortunately, as the app takes you directly to the recipe’s web page, there’s no way to save the ones you like…yet. For foodie amateurs, Foodmatic is an easy way to learn how to put ingredients together (as opposed the terribly difficult process of actually cooking to try out the taste). The interface needs a bit of a facelift, but it’s no hard task to navigate as soon as you realize you can scroll down the lists with your finger; plus, the animated meter is fun to watch. 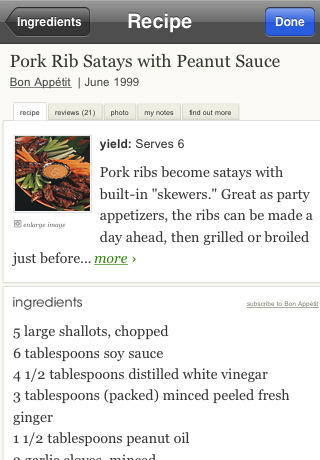 I do wish there were a way to save recipes the app finds for you online, though–that would be a major improvement. Nonetheless, Foodmatic does all the heavy work for you, so cooking’s no longer such a chore…the time saved from looking for recipe websites could be well worth the $0.99. AppSafari review of Foodmatic was written by Julie Guan on November 10th, 2010 and categorized under App Store, Food. Page viewed 3617 times, 1 so far today. Need help on using these apps? Please read the Help Page.